In a quandary this morning. I can understand some things pretty easily, like how General Motors can claim that an electric car that has to be plugged in every 40 miles can get 230 miles to the gallon. I am, of course, a university-certified Marketing Wizard. Other things I understand pretty easily include the idea that pine tar soap should help my scaly scalp condition. I can understand that because it’s one of those things that people just wouldn’t do if it wasn’t good for them…like mixing sulphur and molasses into a poultice and spreading it on an aching joint. That still leaves me with the problem of why the first guy with an itchy scalp thought it would be a nifty idea to spread pine pitch on his head; there are lots of other nasty things that you can apply to your head. Maybe he’d tried all of those. Which makes you kind of sure he was a social outcast. But my problem today is that I just unwrapped a new bar of soap from the Dial soap people and I need help in understanding it. The wrapper claims that the soap is made with cranberries and is a great source of antioxidants. The scent is correct, although probably artificial. But why am I rubbing antioxidants on my outsides? Why couldn’t I just add a quart of Ocean Spray to my bath? Am I in danger of serving the Thanksgiving turkey with a slice of Dial on the side? Why is there no blueberry soap? 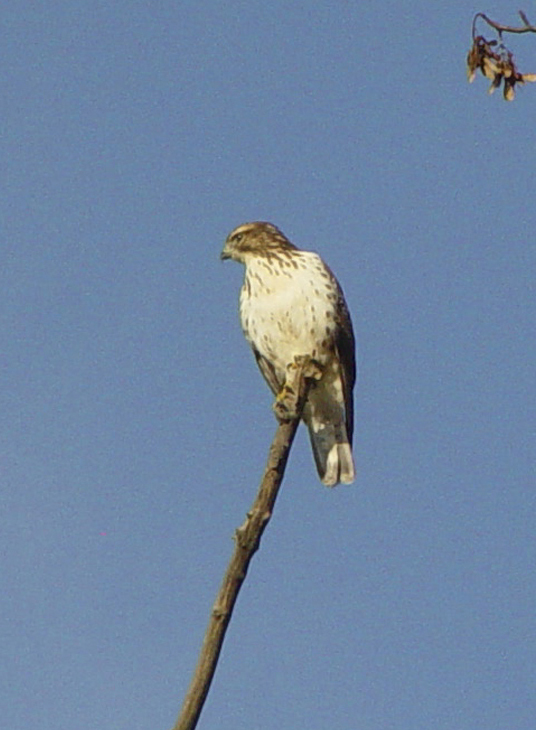 While I work on the answers to these questions, I offer you this image of the hawk spotted during yesterday morning’s walk. The birds in the neighborhood were all chattering, making sure he felt like an outcast.